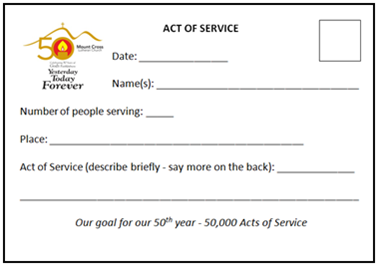 On October 25, 2015, Pastor John issued a challenge to the congregation: that between now and October 23, 2016, Mount Cross perform fifty thousand acts of service for the community. This project is one of the ways we are celebrating our fiftieth year - all year long. An Act of Service can be anything you choose - from the simplest assistance given to a neighbor to large-scale projects involving many people. If you need help with ideas, click on the catalog link to the right and you'll surely find at least one idea to get you started. When you complete an act of service, please click on this RESPONSE FORM link and send us the information about your Act of Service. You can also fill out one of the cards (shown at right), and leave it in the box in the Narthex or mail it to the church. We will use them to keep a running tally of our progress. Note: The act of service will be multiplied by the number of people involved and that will be the number added to the grand total. After being tallied, the cards will be available in an album for all to see. And who knows? Someone else’s service idea may inspire a new one for you. ​to joyfully witness and serve. On the Acts of Service card, please share basic information. You do not need to go into great detail, and you certainly should not share confidential information (names of the people you served, address, etc.). The Act of Service cards come four to a page. If you print your own, try to coax your printer into making them 4" high and about 51/2" wide. That way they will fit in the 4 x 6 photo album we are using to collect them.